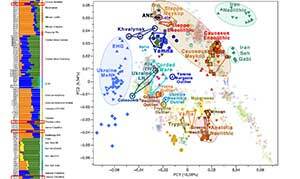 Preprint Paleolithic DNA from the Caucasus reveals core of West Eurasian ancestry, by Lazaridis et al. bioRxiv (2018). We analyzed teeth from two individuals 63 recovered from Dzudzuana Cave, Southern Caucasus, from an archaeological layer previously dated to ~27-24kya (…). Both individuals had mitochondrial DNA sequences (U6 and N) that are consistent with deriving from lineages that are rare in the Caucasus or Europe today. The two individuals were genetically similar to each other, consistent with belonging to the same population and we thus analyze them jointly. 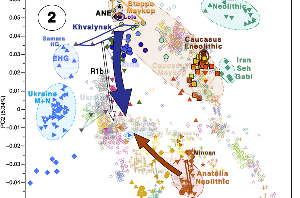 (…) our results prove that the European affinity of Neolithic Anatolians does not necessarily reflect any admixture into the Near East from Europe, as an Anatolian Neolithic-like population already existed in parts of the Near East by ~26kya. Furthermore, Dzudzuana shares more alleles with Villabruna-cluster groups than with other ESHG (Extended Data Fig. 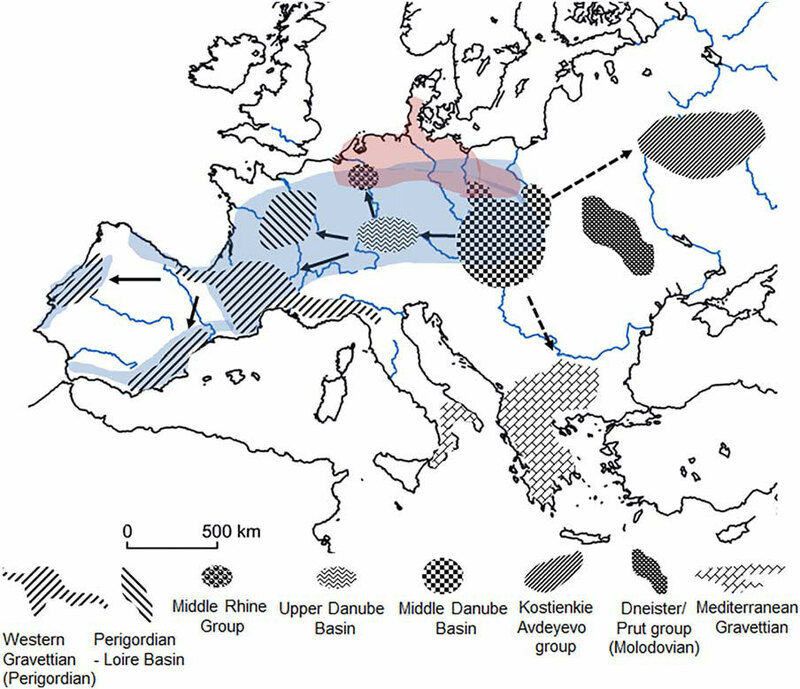 5b), suggesting that this European affinity was specifically related to the Villabruna cluster, and indicating that the Villabruna affinity of PGNE populations from Anatolia and the Levant is not the result of a migration into the Near East from Europe. 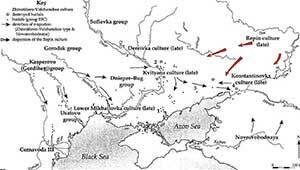 Rather, ancestry deeply related to the Villabruna cluster was present not only in Gravettian and Magdalenian-era Europeans but also in the populations of the Caucasus, by ~26kya. Neolithic Anatolians, while forming a clade with Dzudzuana with respect to ESHG, share more alleles with all other PGNE (Extended Data Fig. 5d), suggesting that PGNE share at least partially common descent to the exclusion of the much older samples from Dzudzuana. Ancient West Eurasian population structure. PCA of key ancient West Eurasians, including additional populations (shown with grey shells), in the space of outgroup f4-statistics (Methods). Our co-modeling of Epipaleolithic Natufians and Ibero-Maurusians from Taforalt confirms that the Taforalt population was mixed, but instead of specifying gene flow from the ancestors of Natufians into the ancestors of Taforalt as originally reported, we infer gene flow in the reverse direction (into Natufians). The Neolithic population from Morocco, closely related to Taforalt is also consistent with being descended from the source of this gene flow, and appears to have no admixture from the Levantine Neolithic (Supplementary Information 166 section 3). If our model is correct, Epipaleolithic Natufians trace part of their ancestry to North Africa, consistent with morphological and archaeological studies that indicate a spread of morphological features and artifacts from North Africa into the Near East. Such a scenario would also explain the presence of Y-chromosome haplogroup E in the Natufians and Levantine farmers, a common link between the Levant and Africa. (…) we cannot reject the hypothesis that Dzudzuana and the much later Neolithic Anatolians form a clade with respect to ESHG (P=0.286), consistent with the latter being a population largely descended from Dzudzuana-like pre-Neolithic populations whose geographical extent spanned both Anatolia and the Caucasus. Dzudzuana itself can be modeled as a 2-way mixture of Villabruna-related ancestry and a Basal Eurasian lineage. In qpAdm modeling, a deeply divergent hunter-gatherer lineage that contributed in relatively unmixed form to the much later hunter-gatherers of the Villabruna cluster is specified as contributing to earlier hunter-gatherer groups (Gravettian Vestonice16: 35.7±11.3% and Magdalenian ElMiron: 60.6±11.3%) and to populations of the Caucasus (Dzudzuana: 199 72.5±3.7%, virtually identical to that inferred using ADMIXTUREGRAPH). In Europe, descendants of this lineage admixed with pre-existing hunter-gatherers related to Sunghir3 from Russia for the Gravettians and GoyetQ116-1 from Belgium for the Magdalenians, while in the Near East it did so with Basal Eurasians. Later Europeans prior to the arrival of agriculture were the product of re-settlement of this lineage after ~15kya in mainland Europe, while in eastern Europe they admixed with Siberian hunter-gatherers forming the WHG-ANE cline of ancestry [See PCA above]. In the Near East, the Dzudzuana-related population admixed with North African-related ancestry in the Levant and with Siberian hunter-gatherer and eastern non-African-related ancestry in Iran and the Caucasus. Thus, the highly differentiated populations at the dawn of the Neolithic were primarily descended from Villabruna Cluster and Dzudzuana-related ancestors, with varying degrees of additional input related to both North Africa and Ancient North/East Eurasia whose proximate sources may be clarified by future sampling of geographically and temporally intermediate populations. 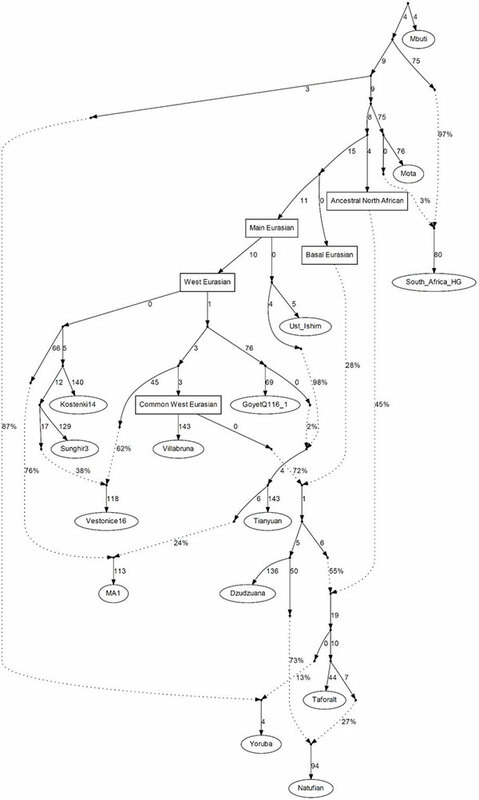 An admixture graph model of Paleolithic West Eurasians. An automatically generated admixture graph models fits populations (worst Z-score of the difference between estimated and fitted f-statistics is 2.7) or populations (also including South_Africa_HG, worst Z-score is 3.5). This is a simplified model assuming binary admixture events and is not a unique solution (Supplementary Information section 2). Sampled populations are shown with ovals and select labeled internal nodes with rectangles. From our analysis of Supplementary Information section 3, we showed that these sources are indeed complex, and only one of these (WHG, represented by Villabruna) appears to be a contributor to all the remaining sources. 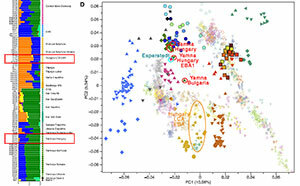 This should not be understood as showing that hunter-gatherers from mainland Europe migrated to the rest of West Eurasia, but rather that the fairly homogeneous post-15kya population of mainland Europe labeled WHG appear to represent a deep strain of ancestry that seems to have contributed to West Eurasians from the Gravettian era down to the Neolithic period. Villabruna is representative of the WHG group. We also include ElMiron, the best sample from the Magdalenian era as we noticed that within the WHG group there were individuals that could not be modeled as a simple clade with Villabruna but also had some ElMiron-related ancestry. Ddudzuana is representative of the Ice Age Caucasus population, differentiated from Villabruna by Basal Eurasian ancestry. AG3 represents ANE/Upper Paleolithic Siberian ancestry, sampled from the vicinity of Lake Baikal, while Russia_Baikal_EN related to eastern Eurasians and represents a later layer of ancestry from the same region of Siberia as AG3 Finally, Mbuti are a deeply diverged African population that is used here to represent deep strains of ancestry (including Basal Eurasian) prior to the differentiation between West Eurasians and eastern non-Africans that are otherwise not accounted for by the remaining five sources. Collectively, we refer to this as ‘Basal’ or ‘Deep’ ancestry, which should be understood as referring potentially to both Basal Eurasian and African ancestry. 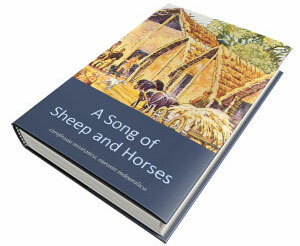 It has been suggested that there is an Anatolia Neolithic-related affinity in hunter-gatherers from the Iron Gates. Our analysis confirms this by showing that this population has Dzudzuana-related ancestry as do many hunter-gatherer populations from southeastern Europe, eastern Europe and Scandinavia. These populations cannot be modeled as a simple mixture of Villabruna and AG3 but require extra Dzudzuana-related ancestry even in the conservative estimates, with a positive admixture proportion inferred for several more in the speculative ones. Thus, the distinction between European hunter-gatherers and Near Eastern populations may have been gradual in pre-Neolithic times; samples from the Aegean (intermediate between those from the Balkans and Anatolia) may reveal how gradual the transition between Dzudzuana-like Neolithic Anatolians and mostly Villabruna-like hunter-gatherers was in southeastern Europe. 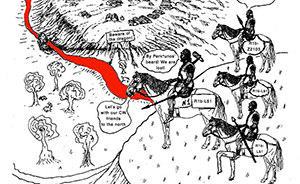 Modified image (cut, with important samples marked). 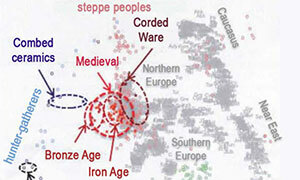 Modeling present-day and ancient West-Eurasians. Mixture proportions computed with qpAdm (Supplementary Information section 4). The proportion of ‘Mbuti’ ancestry represents the total of ‘Deep’ ancestry from lineages that split prior to the 365 split of Ust’Ishim, Tianyuan, and West Eurasians and can include both ‘Basal Eurasian’ and other (e.g., Sub-Saharan African) ancestry. (a) ‘Conservative’ estimates. Each population 367 cannot be modeled with fewer admixture events than shown. Villabruna: This type of ancestry differentiates between present-day Europeans and non-Europeans within West Eurasia, attaining a maximum of ~20% in the Baltic in accordance with previous observations and with the finding of a later persistence of significant hunter-gatherer ancestry in the region. Its proportion drops to ~0% throughout the Near East. Interestingly, a hint of such ancestry is also inferred in all North African populations west of Libya in the speculative proportions, consistent with an archaeogenetic inference of gene flow from Iberia to North Africa during the Late Neolithic. ElMiron: This type of ancestry is absent in present-day West Eurasians. This may be because most of the Villabruna-related ancestry in Europeans traces to WHG populations that lacked it (since ElMiron-related ancestry is quite variable within European hunter-gatherers). However, ElMiron ancestry makes up only a minority component of all WHG populations sampled to date and WHG-related ancestry is a minority component of present-day Europeans. Thus, our failure to detect it in present day people may be simply be too little of it to detect with our methods. 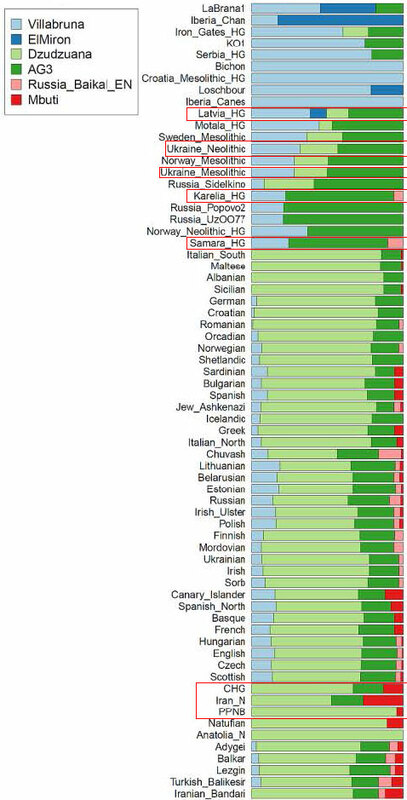 Dzudzuana: Our analysis identifies Dzudzuana-related ancestry as the most important component of West Eurasians and the one that is found across West Eurasian-North African populations at ~46-88% levels. Thus, Dzudzuana-related ancestry can be viewed as the common core of the ancestry of West Eurasian-North African populations. Its distribution reaches its minima in northern Europe and appears to be complementary to that of Villabruna, being most strongly represented in North Africa, the Near East (including the Caucasus) and Mediterranean Europe. Our results here are expected from those of Supplementary Information section 3 in which we modeled ancient Near Eastern/North African populations (the principal ancestors of present-day people from the same regions) as deriving much of their ancestry from a Dzudzuana-related source. Migrations from the Near East/Caucasus associated with the spread of the Neolithic, but also the formation of steppe population introduced most of the Dzudzuana-related ancestry present in Europe, although (as we have seen above) some such ancestry was already present in some pre-agricultural hunter-gatherers in Europe. 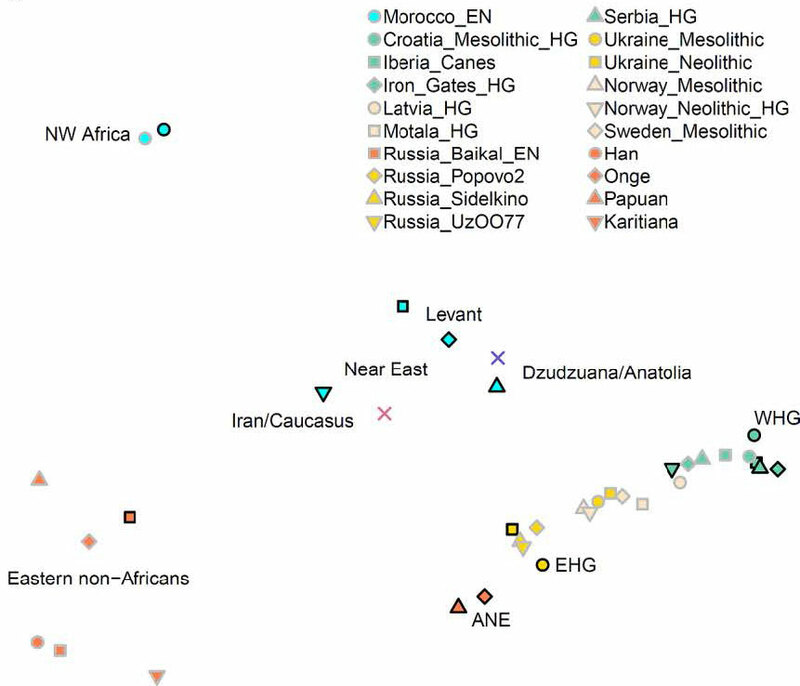 AG3: Ancestry related to the AG3 sample from Siberia has a northern distribution, being strongly represented in both central-northern Europe and the north Caucasus. Russia_Baikal_EN: Ancestry related to hunter-gatherers from Lake Baikal in Siberia (postdating AG3) appears to have affected primarily northeastern European populations which have been previously identified as having East Eurasian ancestry; some such ancestry is also identified for a Turkish population from Balıkesir, likely reflecting the Central Asian ancestry of Turkic speakers which has been recently confirmed directly in an Ottoman sample from Anatolia. Dzudzuana shares ancestry with ‘Common West Eurasian’ (CWE). the ancestor cluster of Villabruna. Dzudzuana diverges from CWE because of a Basal Eurasian ancestry contribution [which supports that Basal Eurasian ancestry was a deep Middle Eastern lineage]. Dzudzuana is closest to Anatolia Neolithic, and close to Gravettian. 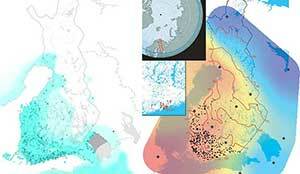 Palaeolithic migrations and clusters in Europe. See more maps. Aurignacian: First West Eurasians arrive ca. 36,000 BP, Goyet cluster expands probably with C1a2 lineages. Gravettian (ca. 30,000 BP): Věstonice cluster expands, probably with IJ lineages. A (hidden) ‘Common West Eurasian’ population. Dzudzuana ca. 26,000 BP derived from Common West Eurasian (curiously, haplogroup G seems to split in today’s subclades ca. 26,000 BP). During the Gravettian (ca. 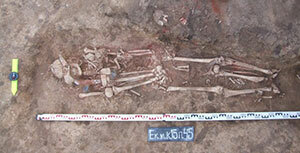 26,000 BP), an Anatolian Neolithic-like population exists already in the Near East. Both Věstonice and this Anatolian HG are close to Dzudzuana; in turn, Dzudzuana from CWE. Magdalenian (ca. 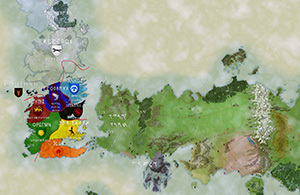 20,000 BP): El Mirón cluster expands, probably with more specific I lineages. Bølling-Allerød warming period (ca. 14,000 BP): ‘late’ Villabruna cluster or WHG (=CWE with greater affinity to Near Eastern populations) expands, probably spreading with R1b in mainland Europe and to the east (admixing with Siberian HG), creating the WHG — ANE ancestry cline, as reflected in Iron Gates HG, Baltic HG, etc. 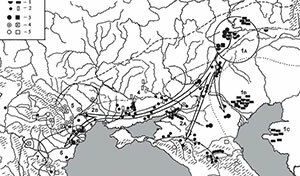 Migration from a geographically intermediate Ice Age refugium in southeast Europe, Anatolia, or the circum-Pontic region that explain post-glacial affinity of post-glacial Levantine and Anatolian populations. EHG (ca. 8,000 BP) = between WHG — ANE (ca. 24,000 BP). CHG (ca. 10,000 BP) = between EHG — Iran N.
I would say that the distinct CHG vs. Dzudzuana ancestry puts CHG probably to the south, within the Iranian Plateau, during the Gravettian, expanding probably later. Also important, Ancestral North African probably accompanied by haplogroup E. Early expansion of North Africans into the Near East further confirms the impossibility of Afroasiatic (much younger) to be associated with these expansions, and confirms that the still unclear Green Sahara migrations are the key.